Turn your real car or automobile into a 3D model on your iPhone! With MyCar! you can easily create a 3D car model of your own real car, automobile, toy car, from a drawing or pictures. MyCar! provides three template car models and a demo car so you can quickly start copying your own car into a 3D model. In three steps for each side of your car you recreate your own car. 2. Select a car side. Repeat step 2 to 3 for each side of your car and you are finished. ● Use the camera to capture the sides of your car. ● Edit the 3D model to match your car. ● Use MyCar! as a toy car including engine and horn sounds, spinning wheels, and smoke effects. ● Record your own car sounds. ● Use MyCar! as an 'in-car' compass. ● MyCar! can measure your speed using GPS. ● MyCar! is fun with 3D graphics on your iPhone. You can make your own crazy car. ● Augmented Reality (AR); make photo's of MyCar! everywhere on the world with the camera background. ● MyCar! is fun as 'in-car' entertainment. ● If you don't own a real car, you now have your virtual one! ● MyCar! makes 3D car modeling easy. 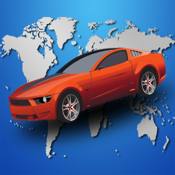 ● Show your car in 3D to your friends and let them hear the sounds. ● Share a photo of your car at a nice place by Email.